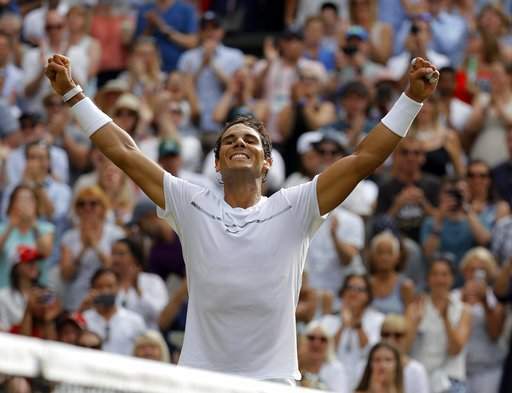 Spain's Rafael Nadal bested young Russain Karen Khachanovto enter the fourth round of Wimbledon, while defending champion Andy Murray had to fight his way through against Fabio Fognini on Friday. LONDON: Spain's Rafael Nadal defeated big-serving Russian Karen Khachanov in straight sets to reach the fourth round at Wimbledon here on Friday, while defending champion Andy Murray defeated Italy's Fabio Fognini 6-2, 4-6, 6-1, 7-5. The world number 1 Murray needed two hours and 39 minutes on Friday to dispatch the tournament's 29th seed in front of 15,000 spectators at Centre Court of the All England Club, Efe news reported. Fognini, 30, who bested the Briton in May at the Italian Open, looked unimpressive in the first set but recovered to win the second and make it a contest. Plagued by an ankle injury, the Italian floundered in the third set. Even so, he was the better player in the early going of the fourth set, taking a 5-2 lead despite being penalised a point for an obscenity. But Murray came roaring back to win five consecutive games and claim a berth in the fourth round, where he will face Benoit Paire of France. "The end of the match was tense. It was an up and down match. I didn't feel like it was the best tennis at times but I managed to get through," the 30-year-old said after the match. "For a while I played fantastic, in the first set and a half, it was a great level," Nadal said. "Then it was a little bit tougher." Nadal reduced the powerful 21-year-old to a mere bystander in the first 30 minutes of the match, moving energetically on the grass on a sweltering late afternoon. It took Khachanov, ranked number 34 in the world, half an hour to get a service hold on the board, in the first game of the second set. The Russian managed to find his form in the third set, forcing it into a tie-break but made three unforced errors to see the chance slip off his hand. "I played some good shots, from the forehand and the backhand," said Nadal. "Happy with almost everything. But in the third, I started to play a little bit shorter." Since losing the 2011 final to Novak Djokovic, Nadal has been knocked out before the quarterfinals for four straight years by a player ranked outside of the top 100. He missed Wimbledon last year with a wrist injury.